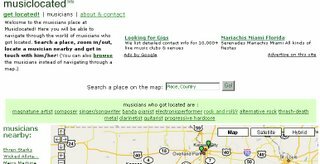 Musiclocated is a project that uses Google Maps and Ajax to let musicians or bands from all over the world locate themselves on a map, so that they can be found geographically and connect. For musician or a band, that helps you let people know where you performace. For fans, they can search musician or a band around the world.